After all the excess of rich Christmas food, I often find myself craving something light and fresh. I really like fish cooked with tomatoes; you may recall a few months ago my recipe for Basa with Tomatoes. 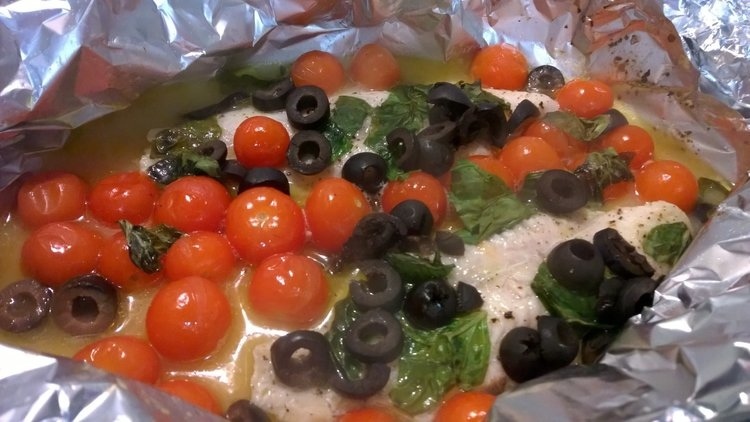 This is another version of fish with tomatoes. The colours evoke thoughts of summer eating, and it couldn’t be simpler to make. – 2 Frozen skinless, boneless fillets of white fish. 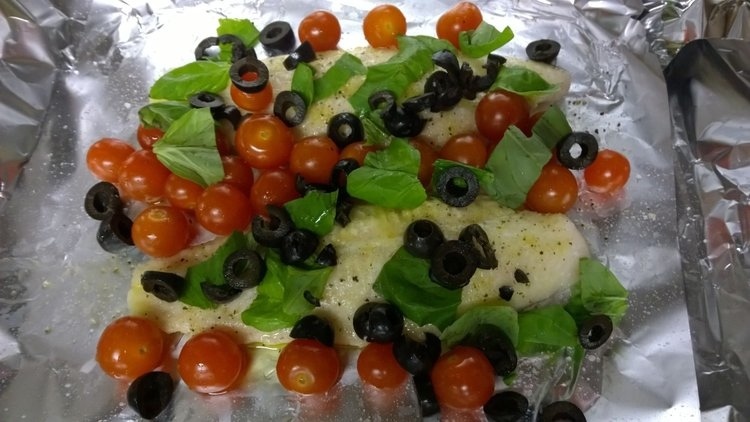 I used Basa again here because I pretty much always have some of that in the freezer (if you use fresh rather than frozen fish, reduce the cooking time). 1. Lay out a large piece of foil, big enough that you will be able to fully, but loosely encase the ingredients (or two long pieces in a cross shape if you only have narrow foil as I did). 2. 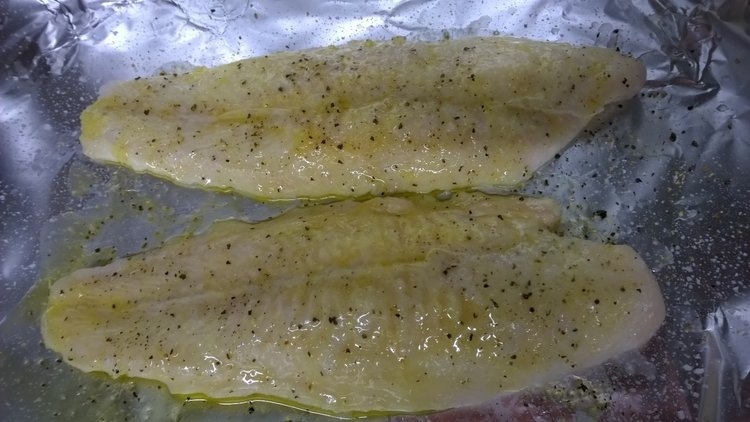 Place the two frozen fish fillets on the foil (If you are making a larger quantity then make more than one foil package, two fillets per foil package is enough). Generously brush the fillets with olive oil and squeeze on a good amount of lemon juice. Spread the crushed garlic over. Season well with salt and pepper. 3. Throw on the cherry tomatoes, slice the black olives and throw them on, roughly the tear up the basil leaves and scatter them over too. 4. Gather the foil up and roll the top and sides to fully encase the ingredients, try to not leave any gaps, but don’t wrap it tightly, you’re creating a kind of tent for the steam to build up inside and cook it. 5. Place in a pre-heated oven 180C/350F for 25-30 minutes. Check it after 25 minutes by opening up the foil and gently pressing a knife into the fish to see if the flakes separate easily. If it doesn’t seem done, seal it back up, put back in the oven for 5 minutes and check again. 6. I like to serve this with simple boiled or mashed potatoes, or rice – something that will soak up all that lovely juice. No fish for me, but Happy New Year to you!! I know this is delicious and I would normally just love to eat it, but at the moment just the thought of it makes my stomach hurt. Still definitely off my feed. Being able to enjoy food is one of those things we just completely take for granted until we can’t do it anymore! I really hope you start to improve soon and can get back to enjoying some things again (not just food of course!). I love simple fresh tasting things like this, whatever the time of year, and so easy! Happy New Year, Vanessa. I see you’ve prepared a fantastic lunch. I’ll be right over while it’s hot. You DID make extra, I hope. Where are you Tess? It’s getting cold!